The Field of Laparoscopic Surgery has advanced beginning from its cautious application on basic procedures using limited technology to bold new interventions and technological innovations which has let Surgeons expand this exiting field into horizons which were unthinkable in the past. Laparoscopic Colorectal Surgery has posed significant challenges to Surgeons especially when the assistant Surgeon has to hold and retract the bowel simultaneously and optimally for the Surgeon to dissect in the right plane. The use of portable ports using Vacuum and Magnets has been suggested by the author. Laparoscopic instruments using conventional ports can retract adjacent segments of bowel at multiple points using portable pulleys stationed on the abdominal wall held on with vacuum suction and magnets. 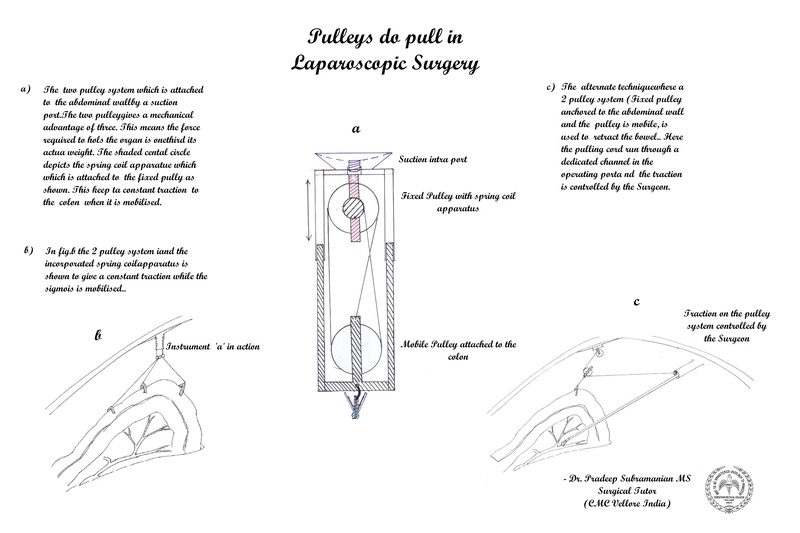 I am developing a prototype model of such portable pulleys that are held by suction on the Laptrainer developed by me simulating the vivo surface for the instrument to dock on to the abdominal wall.